For several years, those in the Barlow Bob email loop were treated to a Word doc containing a list of East Coast Star Parties, complete with web links and locations “Courtesy Barlow Bob and Friends.” Starting two years ago, this event list was compiled by Barlow Bob and Chuck Higgins of the Mohawk Valley Astronomical Society. For my part, this list served two great purposes. First, it allowed me to keep track of (and pass along) astro events not too far from Central New York (many an easy drive for overnight stays). Second, it was a great way to see how other clubs had their websites arranged (which was great for stealing ideas and widgets – it’s a large enough community where you can see what seems to work and not work with only a few hours of snooping around!). 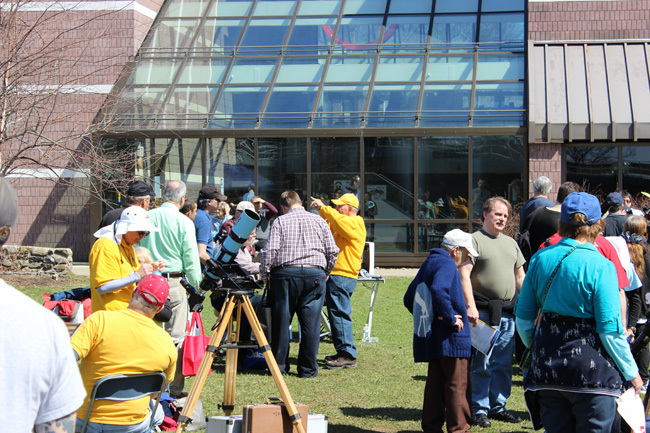 Barlow Bob at the center of the 2014 NEAF Solar Star Party. As a way to continue Barlow Bob’s tradition of outreach beyond his own solar observing sessions (I often called him the “Postman of Amateur Astronomy” for the number of emails he would forward along), I am pleased to report that the compilation of 2015 Star Parties has been completed (and we’ve only missed a few events already) by Chuck Higgins and myself. The link can be found when you hover over the “Calendar” link above and an official page has been setup on the CNYO website, complete with PDF, DOCX, and HTML versions (the HTML case so you can copy + paste the table into your own pages if you like). The list is, as of 6 April 2015, as accurate as our web searches and other organizations’ websites has allowed – but we expect a few changes to appear as situations require and as some organizations announce their official dates. We’ll keep the official page here updated accordingly. In the meantime, I see this list and can only remark on how many clubs we have in the US full of members who enjoy and appreciate the Night Sky. As you’ll see checking out event info pages, these Star Parties are usually wide open to the public as well. As someone who’s organized such events, I can say with certainly that it is no trivial matter to arrange all of the details for a successful Star Party. That is to say, the hosts for these events really want *you* to enjoy and appreciate the Night Sky as well. If you see a problem, want to add an event, or have any other comment about the page, please drop a line to info@cnyo.org and Chuck and I will reply accordingly. Otherwise, get yourself outside a few times this year!